As we age, many of us begin taking more medications to control newly diagnosed conditions or manage chronic diseases, increasing the risk of dangerous drug reactions or interactions. At the same time, natural changes in the body can affect how our body reacts to medications. For these reasons, it’s important to keep track of our medications and be aware of any problems. As we get older, most of start taking more prescription drugs, as we are diagnosed with long-term, chronic illnesses. There’s a pill to lower cholesterol, to thin blood, to control diabetes and to ease the effects of asthma and gastroesophageal reflux disease (GERD). In addition, most of us take supplements, including vitamins or other over-the-counter (OTC) drugs such as aspirin and antacids. All of this pill popping, known as polypharmacy, can increase the risk for potentially dangerous drug interactions. In fact, every year, one in three adults aged 65 and over has one or more harmful reactions to a medication, according to the American Geriatrics Society. The aging process can cause changes in the way medications are absorbed, distributed, metabolized and eliminated. Reduced kidney and liver function, for example, could affect how some medications are broken down or excreted from your body. Age-related changes in your digestive system and body composition can also influence the effectiveness and amount of medication that enters your bloodstream and reaches its destination. 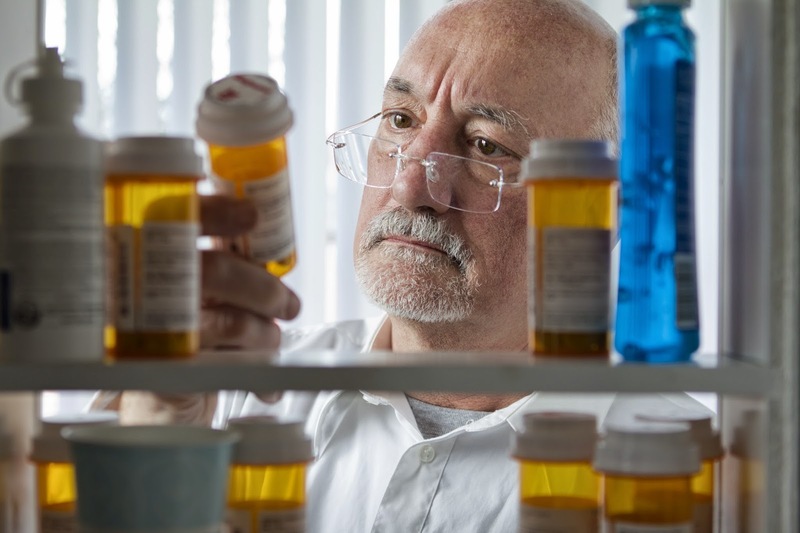 In addition, keeping track of multiple medications and taking them exactly as prescribed can be difficult, especially for those who are memory challenged. Knowing when to take the drugs and in what manner is also important, although most of us would likely do better than the patient of the fictional TV doctor on House M.D.When she complained to Dr. House that the inhaler he prescribed wasn’t helping her asthma, he asked her for a demonstration. When she sprayed it around her neck, like she was applying perfume, he just gave her a wan smile. How many times a day should I take it? At what times? Right patient: Don’t take anyone else’s medication. Right drug: Take the right medication; some pills look alike. Right dose: Because dosages are changed to achieve improved therapeutic effect, be sure you take the correct dose related to the right drug. Right route: Most drugs are taken by mouth but prescriptions may include warnings about crushing or splitting and use of patches. Right time: What does “2x a day” mean—at 12-hour intervals, or is morning and before bedtime OK? Should medication be taken with food or on an empty stomach? In addition is the right response: make sure the medicine is working. Is the blood pressure pill actually helping lower blood pressure? When should you follow up with the physician on the drug’s effectiveness for you? Contact your physician immediately if you experience any adverse reactions. Medications can interact in harmful ways. Although your pharmacist should warn you about possibly dangerous interactions, he or she may not know all of the prescription and nonprescription drugs you are taking. Additionally, the U.S. Food and Drug Administration (FDA) warns that dietary supplements can alter the absorption and metabolism of prescription and OTC medications (HealthDay News). Some dietary supplements may increase the effect of your medication, while other supplements may decrease it. For example, the herbal supplement ginkgo biloba and vitamin E can thin blood. Mixing either supplement with the prescription blood thinner warfarin or aspirin could increase the risk of internal bleeding or stroke, the FDA states. Other OTC products, such as vitamins, minerals, antacids, sleep aids and laxatives, can interfere with the effectiveness of other drugs. At the same time, be aware of side effects from your medicine: for example, dizziness and drowsiness that could lead to a fall; stomach upset, diarrhea or constipation; blurred vision; dry mouth; and fatigue or lack of energy. Know what to expect, how long the side effects may last, what to do if they occur and when to contact your doctor. In some cases, your doctor may tell you to stop taking the medication. (See sidebar, “Questions to Ask Your Doctor.”) And be aware that some generic drugs may have different side effects than brand-name medications. “Prescription for Saving Money on Drugs,” December 2014, Senior Spirit ). It's important to take your medication at the right time (i.e., morning, evening, with meals or without) and in the right dosage, as prescribed by your doctor. If you experience unusual side effects, you should talk to your doctor immediately. At the same time, don’t stop taking your medication without talking to your doctor first, even or especially if you start feeling better. Some medications, such as those used to treat chronic conditions, such as high blood pressure, diabetes and GERD, typically only work when taken regularly. Do not skip doses or take twice as much for a missed dose. Consult with the doctor or pharmacists if you fail to take medication on time. The amount of medication you are prescribed is based on research reviewed by the FDA. Faced with an array of different medicines that need to be taken at different times and in different dosages, it’s easy to make mistakes. Using a memory aid can be helpful, such as always taking the drugs at meals or bedtime (being aware that certain medicines should only be taken with food). Other people use charts, calendars or pill boxes. Pharmacies are becoming more proactive about this issue, aware of the possible dangers of clients missing their medications or taking them at the wrong time. “Compliance packaging” comes in a variety of options: “bubble pack,” in which your pharmacist labels your daily medication, which are contained in one package; the pill timer, a programmable prescription cap that sounds an alarm when your medication is due and resets when the container is opened; or a delivery service that comes on a regular basis, based on your refill schedule. For those who want something even more comprehensive, and high tech, the CompuMed Medication Dispenser automatically dispenses the proper medication at the right time, alerting you with an alarm and instructions that appear on a screen (i.e., "take with food"). The 4,600 pharmacies of Walmart and Sam’s Club provide medical packages that include drug details, photos of the specific drugs and a child-resistant release button that instructs the consumer to press and hold a corner tab to slide open the product. This should include OTC products and dietary supplements, as well as prescription medicines, and the name of each medicine and the doctor who prescribed it, the reason it was prescribed, the amount you take and time(s) you take it. It’s a good idea to keep the list with you at all times to share with other health care providers, such as specialists and different pharmacists, and even dentists. In an emergency a medicine list can alert ambulance drivers and hospitals to your situation. At least once a year, review your medications with your doctor, especially if you have new ones. Various online programs can help you keep track of your medicines and supplements, such as mymedmanager. The FDA provides a free worksheet. New research is refining the process of drug taking. Some research is showing that the time of day a medication is taken can impact its effectiveness. For example, the best time to take long-acting antihistamines is evening because the immune system peaks in the morning, so your body is better prepared the next morning. Also, people have different genetic compositions that can determine their responses to drugs. In fact, genetics have been estimated to account for 20 to 95 percent of the variation in individual responses to medications (Pharmacogenomics Journal) Pharmacogenetic testing has the potential to tailor and personalize medication therapy because it indicates a patient’s likelihood of having an adverse and/or a therapeutic response to a medication. Genetic testing would aid the problem of poor medication “adherence”—a patient’s motivation to stick to their prescribed treatment regimen—by helping to boost confidence in the safety and efficacy of prescribed medications. Medication nonadherence is a well-known problem, particularly in patients with chronic conditions, and results in increased illness, death and health-care costs. It is estimated that the annual economic burden of nonadherence is about $300 billion in the United States. Take Care with Prescription Drugs was featured in the January 2015 Senior Spirit Newsletter.